Washington, D.C. (June 28, 2017) – The Golden Triangle Business Improvement District (BID) is pleased to announce the 2017 winners of its annual Golden Streets contest, a friendly competition among participating commercial properties within the 43-square-block central business district, stretching from the White House to Dupont Circle. Nineteen participating buildings created landscaping displays around the theme ‘Hot, Hot, Hot” in tree and flower boxes along sidewalks in front of their buildings. 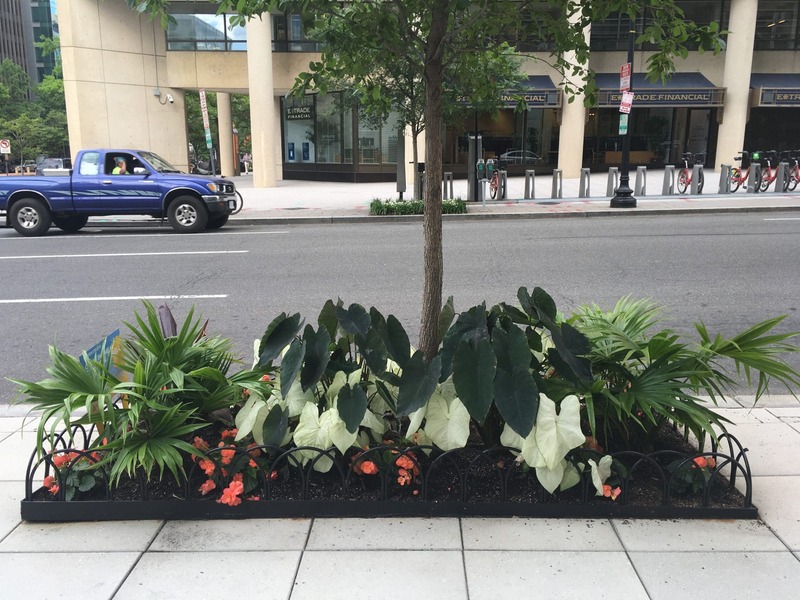 Best in Design: 1900 K Street, NW – “Oasis in the Concrete Jungle,” which featured tropical, lush and vibrant plants and flowers, as an intended escape from the summer heat” of the city. The property is owned by TH Real Estate, an affiliate of asset manager Nuveen (the investment management arm of TIAA) and managed by Hines, a Houston, Texas-based global real estate firm with the landscaping done by Chapel Valley Landscape Company. 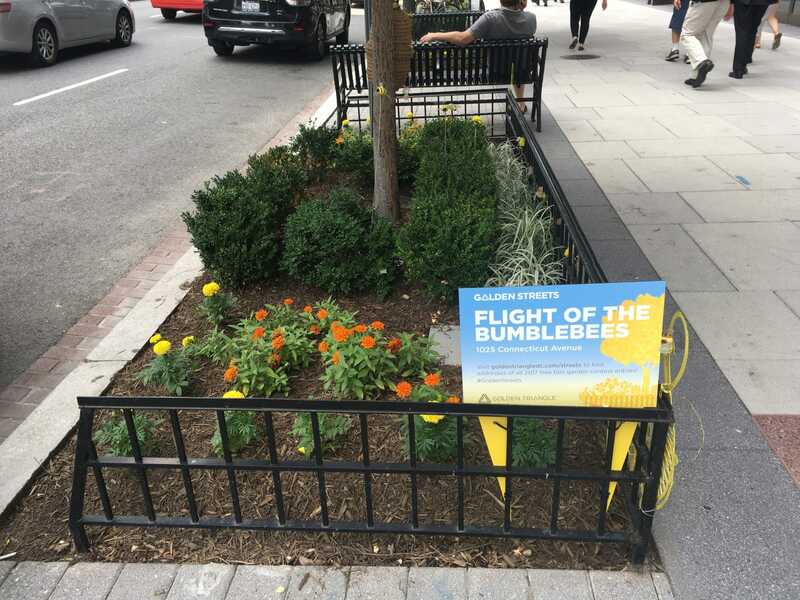 Best in Sustainability: 1025 Connecticut Avenue, NW – “Flight of the Bumblebees.” Judges noted the project’s good use of plants that are most likely to thrive in the D.C. climate, while also requiring less water and plant turnover for maintenance. The property is owned and managed by Washington, D.C.-based Blake Real Estate and the landscaping is done by Rolling Greens. To engage the broader community in the program, the Golden Triangle created a “Great Pineapple Hunt,” inviting area workers, residents and visitors to explore the Golden Streets in search of a hidden pineapple sign. Each day over a two-week span, two pineapple signs have been hidden in a different Golden Streets flower box. Those who find the pineapple signs and submitt selfies with them on social media have been entered into a drawing to win $50 gift cards to local merchant stores or restaurants. 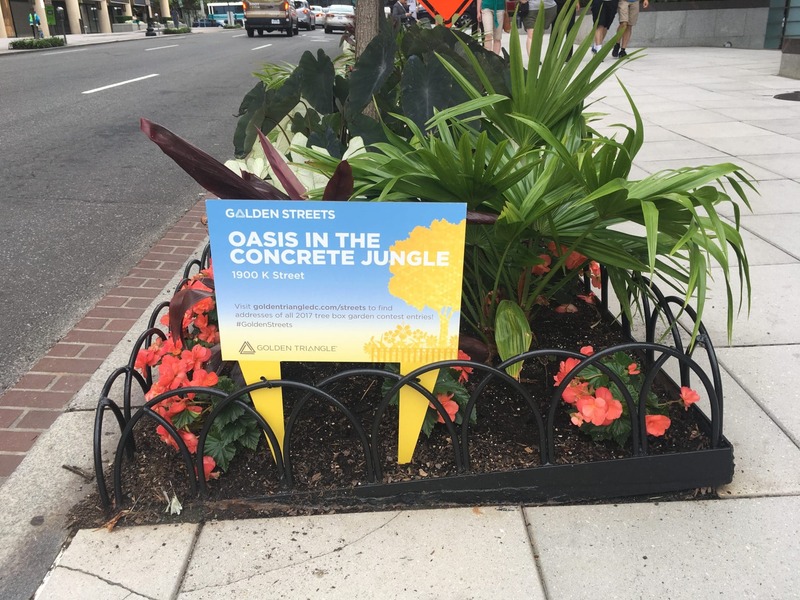 More information about the 2017 Golden Streets contest can be found at https://goldentriangledc.com/golden-streets-2017/.